When Friend of the Family is committed to a story, each character controlled by an opponent committed to the same story gets -1 skill. 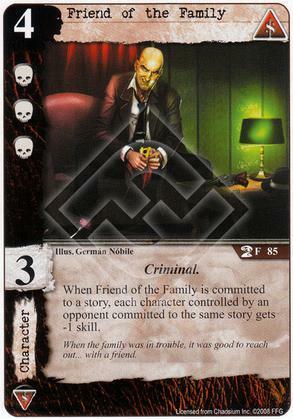 Flavor Text: When the family was in trouble, it was good to reach out... with a friend. lasting effects is applied to the card. lowering that character’s skill by 2. Young Deep One has a skill of -1.
skill would count as though it were zero.